It occurred to me then that, although Knitting for Charity has featured charities that assist the elderly, we hadn’t really written much about specific tips in knitting for elderly folks. So, I turned to experts! 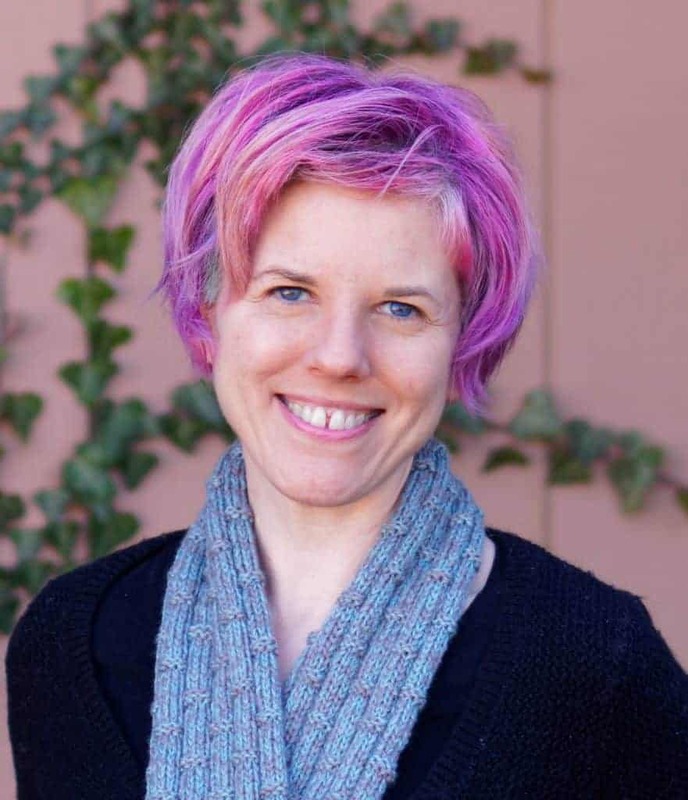 Sue McGorie ran the knitting charity Sunshine International Blankets of Love, or SIBOL. Bev Q runs the website Bev’s Country Cottage, featuring all kinds of knitting for charity. 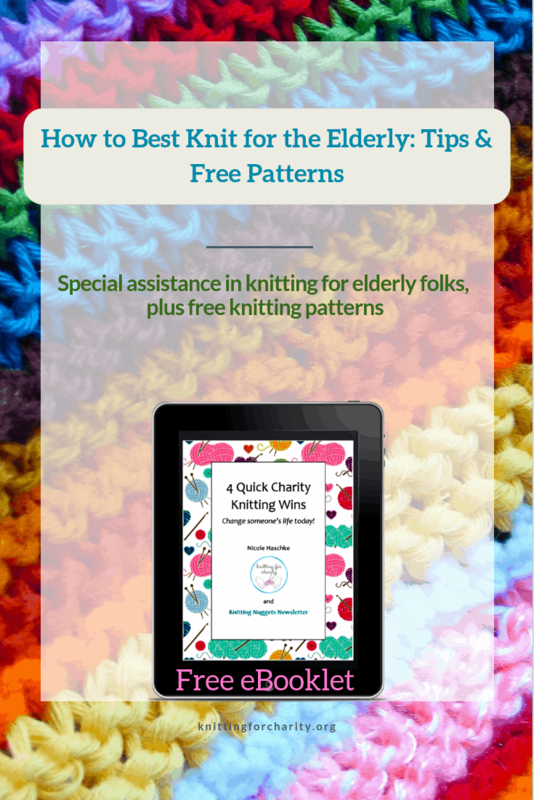 So read on for some great tips on knitting blankets for the elderly, and then take a look at the links to some terrific free patterns! 1. Elderly residents love bright colors. So if you have some bright yarn colors in your stash that no one else seems to want because they’re “loud,” those would be great for blankets for the elderly! 4. For an extra-practical touch, sew a simple pocket (just a little square) on one side of the blanket. This makes a nice storage spot for tissues. 1. Most nursing facilities appreciate small afghans/lapghans (36″ x 45″ or so), shawls, gloves, wheel chair and walker totes, and slippers or handknitted socks. 2. Handknitted slippers need to have some kind of skid-resistant paint, or material on the bottom for obvious reasons. 3. Nice soft yarn is wonderful for aging, fragile skin, and lovely bright colors are terrific to brighten their days! Thank you, Sue and Bev, for the great tips! Now, how about some patterns? First, I would be remiss if I didn’t link to Bev’s Country Cottage’s fantastic page of patterns for seniors. This is probably the best set of links I’ve seen. Ten Stitch Blanket: this results in a gorgeous geometric design and is a fantastic stash-busting project. Eleventh Hour Blanket: I will always find this pattern enchanting. The textured stitches are gorgeous, and I love the border. If you’re looking for quick and simple, look no further! Quilt and Cable Blanket: This blanket features some of the most unusual cables I’ve ever seen. It looks far more difficult than it really is and produces a quilt-like fabric. Ten Stitch Zigzag: By the designer of the Ten Stitch Blanket, this produces a striking textural zigzag pattern. Basketweave Afghan: I knitted this afghan myself a few years ago and loved it. The afghan it produces is so warm and cozy! Universal Yarn Afghan Knitalong: This is actually an afghan knitalong collection of many different squares. You can take whatever squares most appeal to you and include them in your own afghan, then sew them together at the end. This is a great portable and stash-busting project! Color Block Blanket: Another portable project that you can work in individual pieces and then sew together at the end. You can make this blanket as small or as large as you wish. Finally, here are some “lapghans” — small afghans to place over your lap to keep your legs warm, especially great for wheelchair-bound folks. While these are technically baby blanket projects, they are actually the perfect size for a lapghan. Sunny Blanket: Here is a wonderfully square-textured pattern with lots of visual interest. PomPom Cuddle Blanket: Be forewarned, you may find knitting with the pom-pom yarn this project requires tricky. However, if you’re up for the challenge, I think you’ll find the results are worth it. It creates a fabulously squishy-textured lapghan. Honeycomb Stroller Blanket: Did someone say “visual interest”? This blanket is absolutely packed with it. The gorgeous honeycomb stitch pattern is positively eye-popping! Fluffy Brioche Baby Blanket: This fantastic small blanket pattern features a brioche stitch that produces a gorgeously rich waffle-like texture. Heart Baby Blanket: As you might have guessed, this lovely blanket features textured hearts. Four Corners Baby Blanket: Finally, this blanket uses simple miter squares and purl ridges to create interesting textures that look a lot more difficult than they are. Armed with these tips and patterns, I hope all you wonderful knitters are ready to dive into charity knitting for the elderly! I so enjoy your emails when they come. Living in Afrca is somewhat isolating, and it is great to see what others are doing. Thank you for your time in getting the emails Oglethorpe and sending the, to us.